Warning: Minor spoilers for season 5. Fairy tales have been serving as popular entertainment for literally hundreds of years, and one of the more prominent contemporary adaptations is the US television show Once Upon a Time, now in its seventh and final season. Part of Once Upon a Time’s charm has been its enticing collage of familiar characters – not only from fairy tales but from popular fiction and folklore. Though these characters are frequently taken from their most popular media counterparts (e.g. the Disney film versions) they are still ultimately drawn from the earlier source material that provides the foundation for all fairy tale retellings today. When it first aired, Once Upon a Time offered a set of reinvented heroes. 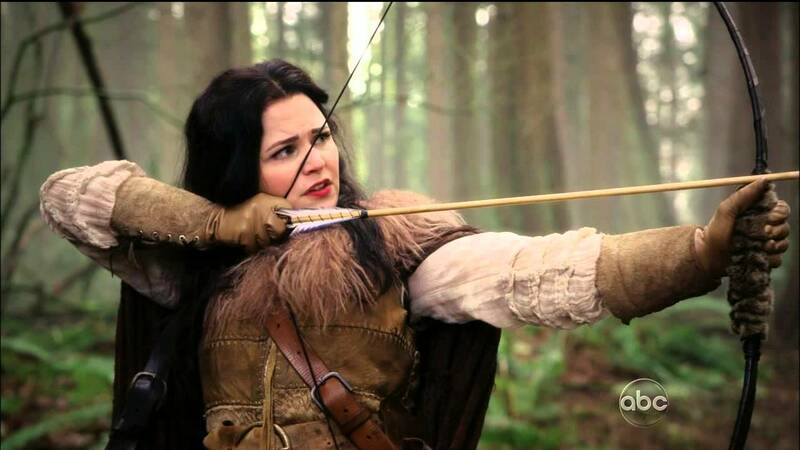 Most notably is the case of Snow White who, in her fairy tale life, was a strong ruler and a Robin Hood-esque fighter for her people, literally using a bow and arrow to defend herself while hiding in the woods from the Evil Queen. However, much like most fairy tale retellings, the revitalisation of the characters is only offered to the heroes and heroines. As a fairy tale scholar I was keen to see the ways in which the show would take the opportunity to subvert the source material, and one of the storylines that would have done so – a storyline that was obvious to me as a consumer of both the show and the earlier versions of the tales – took place in the beginning of the fifth season. What happens (and this is a spoiler) is the original heroine Emma becomes the magically charged ‘Dark One’, and in an attempt to conceal this fact from the court of Camelot, it is the formerly Evil Queen – Regina – who claims to be the foretold ‘saviour’ of the fairy tale world. Snow White as the non-damsel in distress. Source. When the narratives of the villains are taken into account, it is disappointingly clear that true subversion rarely exists in fairy tale adaptations such as Once Upon a Time. While some may claim that the development and agency offered to the heroes is enough, the lack of treatment offered to those outside of the moral high ground ensures that the narrative structures of good and bad are continually replicated through every retelling that comes along. Though this is not necessarily a bad thing, especially when we take into account that much of the appeal of fairy tales lies in their clear cut patterns of good and evil and the expected happily ever afters. However, in repeating these tired patterns again and again, the showrunners of Once Upon a Time have shown that their storylines are not going to be engaging in subversive action any time soon. By engaging with multiple source texts and reinventing the familiar characters, the creators of Once Upon a Time could have reinvented the familiar in a way that offered genuine subversion to the traditional patterns. There is reasoning behind the enduring popularity of fairy tales and other popular figures from folklore and fiction who appear in the show (such as Captain Hook from J. M. Barrie’s Peter Pan, Hercules from Greek Mythology, and even on occasion Doctor Frankenstein). However, the traditional format of the fairy tale genre can only stretch so far when you’re making seven seasons of a programme that has made itself dependant on this format. As for me, I will likely watch the show to the very end because I am curious to see if there will be any surprises to revitalise the show in the same way that the show attempted to revitalise the old tales. Nevertheless, so many episodes have been produced and there’s been no sign of an attempt at genuine subversion; it must be time for this viewer to accept that despite the potential of subversion that the format of Once Upon a Time offered, the show is going to continue to provide a somewhat tired narrative format until the very end.